Looking for a perfect google analytics alternative? Matomo is the answer for that. Matomo, a free script is the top opensource alternative to google analytics that helps you keep your data controlled. Matomo opensource script lets you full control over your data. The privacy at Matomo is built-in, which gives you access to collect information about visitors from websites, apps and the IoT. It also helps you pull off insights. Matomo previously piwik provides you with a range of latest features to empower you and get a 360 visual of your customers. That data could be used by you to understand behavior of visitors, track transactions, increase conversion rate and generate more revenue. 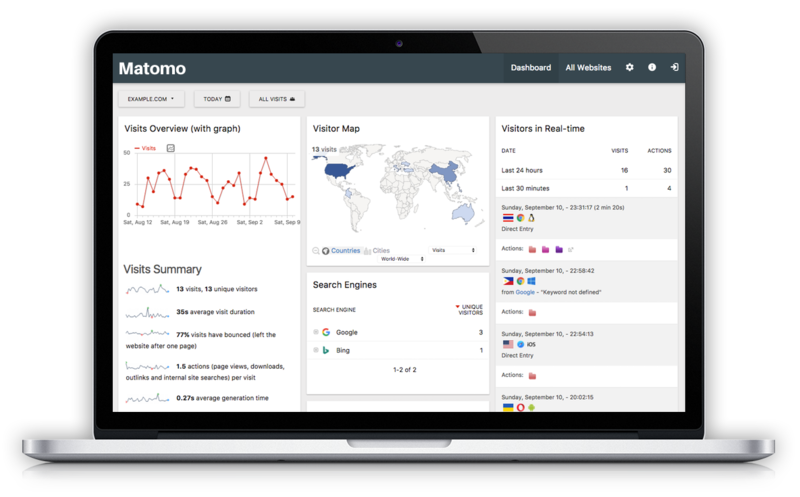 Matomo offers an open source google analytics script with built-in privacy to be used frequently. The service is being used by 1 million websites globally and has been translated in 53 languages.